RentalsAndSales.Co.UK operate an ethical and transparent service to both landlords and tenants alike. In our 28 years established business, we have never had any hidden fees – believing this industry requires honesty, passion and care when managing tenancies. We have removed the need for expensive, unnecessary admin fees for both tenants and landlords. We have a belief that we can provide a high quality service online and offline at a reasonable cost. Applying for a property, placing a holding deposit, setting up a tenancy, processing the deposit, drafting the contract - these services all have no cost to the tenant. One thing you will be charged for when renting a property via rentalsandsales.co.uk , is for referencing. This is a maximum of £30 per tenant including for guarantors. The reason we charge for referencing is because it costs us money directly from the supplier (who obtains credit checks, employer references and previous landlord references). We have to pass this cost on. It also makes sure each tenant applying is serious about the property - as repeatedly applying for properties knowing you will fail references will quickly become costly. HOLDING DEPOSIT EQUIVALENT TO TWO WEEKS RENT (DEDUCTED FROM THE 1ST MONTHS RENT) IS PAID as part payment of all your move in monies as we COLLECT REFERENCES & PREPARE THE MOVE IN PROCEDURE. REFERENCING INCLUDES: IDENTITY, IMMIGRATION AND VISA CONFIRMATION, FINANCIAL CREDIT CHECKS, OBTAINING REFERENCES FROM CURRENT OR PREVIOUS EMPLOYERS / LANDLORDS AND ANY OTHER RELEVANT INFORMATION TO ASSESS AFFORDABILITY.IF A GUARANTOR IS REQUIRED A REFERENCE CHECK FEE OF £30 PLUS VAT WILL ALSO BE DUE. 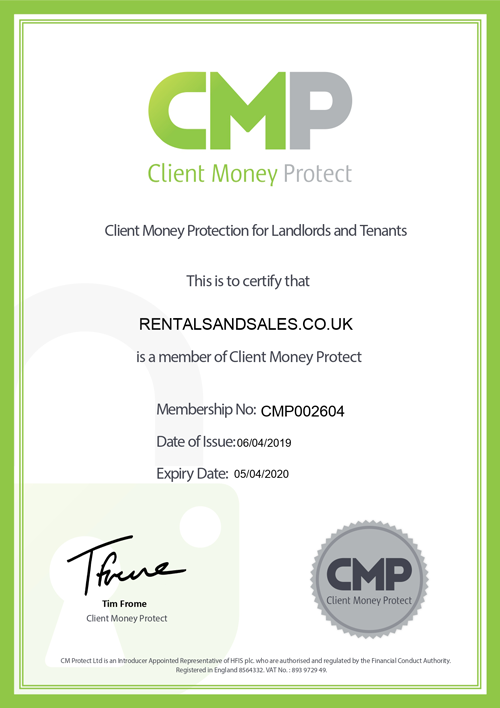 It is now a legal requirement for all agents to display if they have client money protection or not.